In the Choosing Wisely initiative, nine medical groups have contributed their list of five misused and overused tests and treatments. Some of the highest cost-of-care groups are on board–cardiologists, oncologists, radiologists, nephrologists (kidney) and gastroenterologists. Front line doctors, like internists and family doctors, have also weighed in. Coming soon are lists of five from the palliative care doctors, geriatricians, rheumatologists, allergists, ENTs, echocardiographers and this ever-important group, the hospitalists. –First is the expanding healthcare behemoth of Atrial fibrillation (AF), the chief disease that heart rhythm docs treat. AF is the number one cardiac reason that patients are admitted to a hospital and it affects approximately 3 million US patients (and is growing in prevalence). Patients with AF enjoy a rapidly expanding array of innovative yet expensive technologies, including new blood thinners, new catheter ablation techniques and surgical therapies. –The second reason why Heart Rhythm doctors should contribute stems from our use of invasive and costly devices. On the one hand, pacemakers and defibrillators (ICDs) offer selected patients incredible benefits, but on the other hand, they can also burden patients with costly and dangerous adversity. 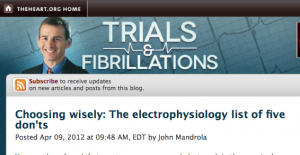 The full post is up on the Trials and Fibrillation blog over at theHeart.org. I’m looking forward to the Heart Rhythm Society’s list of five. Until then, you have mine–as seen from my front row seat to the real world of clinical practice. “Choosing Wisely”–A great name for a great plan. thinner are you on? My Dr. wants me to go on Pradaxa but I’m too afraid to start. I do not take blood thinners. I haven’t had an episode of AF in over a year now. (Knock on wood.) Even if I had AF, my CHADS-VASc score is zero, which makes my yearly risk of stroke < 0.5%. The way I ride a mountain bike (my teammates nicknamed me--in jest--"Cat"--for cat-like reflexes--NOT), the risk of trauma-relating bleeding on blood-thinner would be greater than stroke. I like your question though because it highlights the difficult decision to use blood thinners. I tell AF patients that the number of risk factors determines the stroke risk. The more risk factors, the greater the benefit of blood thinners. If you asked your doctor why, she would probably tell you that your stroke risk is greater than your bleeding risk. Keep in mind too, most patients get through bleeding episodes without long-term defects. Strokes are not like that. Second strikes occur far less often in AF patients who have a stroke. 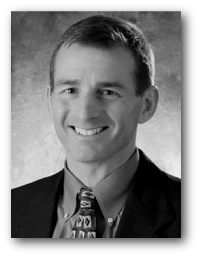 Dr. John, if you were on a blood thinner, would that make you curb your biking activities? 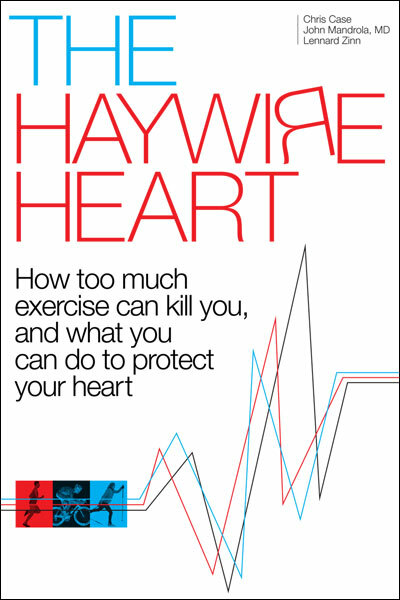 I have been on blood thinners for a few years now (had a stroke event after my first ablation, but up until then my CHADS was like yours) and am still trying to figure out where to draw the line with regard to types of exercise.